Back to school time brings backpacks by the back door, papers flying in from kids, and upcoming activities, back to school night and more. Create a command center and landing strip that helps you control the information and stuff. Establish a command center with a slot of your kids’ papers and the mail. The slots can be a wall pocket, basket or cube, labelled with their names and your name. If you use a desk, the command center can be a desktop sorter with hanging files also labelled with names. 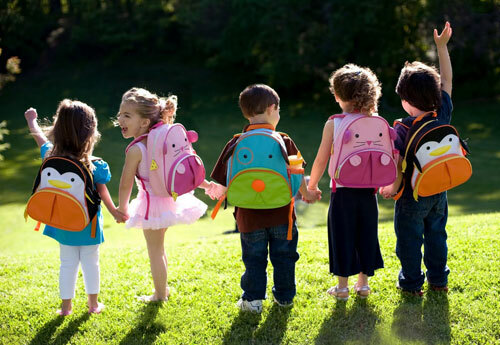 Choose a spot for your kids’ backpacks. Hooks should hold up to 40 pounds since backpacks are heavy! One hook per backpack please, also labelled with their names. Baskets and bins are also great options. Keeping items corralled is the key. Post your family calendar, a dry erase board and a bulletin board in this area. The calendar is to keep all the upcoming dates. The bulletin board and dry erase boards are for reminders, invitations, and appointments. Chalkboards are popular too. Don’t forget a pencil attached by a string just so it is handy too. Your family chore chart can be added too. Host a family meeting and talk about where the backpacks and papers go each day. Empty the papers out and put in the mom or dad’s slot, hang backpack back after homework, parent replaces paper each evening, and everyone is ready for the next day. Do you have a family command center idea to share? What works for you? Back to school! 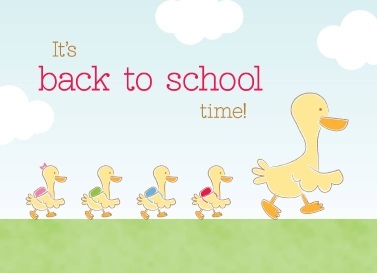 Its that time of year that makes moms happy and sad; happy to start new routines and sad about the energy and organization it can take to get your family going. Throughout the month of August we are featuring organized moms who will help get you started back to school with the toughest tasks. Moms are challenged to get everyone out the door on time with a smile. These ideas can get everyone’s day started off right. * Unload the dishwasher – I loathe spending extra time in the kitchen late at night when it feels like I’ve been in there ALL DAY, but it’s so worth it to start the morning with a clean kitchen. The breakfast dishes are a quick rinse and load and then I’ve got a clean kitchen again. * Pack lunches, fruit break, water bottles – another kitchen chore that I despise doing at night, BUT it’s even worse to deal with the next morning, so I make myself get it done! When I slack off and don’t do one or more of these chores the night before, the result is a scattered, hectic morning – not a good start to the day! Another trick that works for me is to require that the kids eat, dress, put on shoes, and brush teeth and hair before they watch any cartoons. They are motivated to get these small chores done and they enjoy having 10 minutes or so of TV time before we head to school. Meredith Delap is a stay at home mom of three. She enjoys reading, the beach, and peace and quiet. Fall is around the corner and now is the time to establish successful strategies and routines. This time of year we are ready to begin again, even more so than at the new year. When families work together new routines, the results can be amazing! Communication is the key. No one likes to be told what to do whether you are an adult, teen or even a young child. Asking questions can make the difference on helping your children be successful in school and working together on solutions for family responsibilities and routines. Here are some questions to help your family get a great start this fall. Host a family meeting to collaborate on this. What are your personal goals for this next year? Help your child establish a minimum goal for one area by asking what specific actions they will take to accomplish this goal. Ask them how you can help them reach the goal. Share with them one goal you have too and ask for their help. What is the best way for you to keep up with your calendar, recording your homework and other activities? Families can set up a month at a glance calendar in a prominent place for everyone to see or use a digital calendar and print out the month at a glance. Each child will need their own planner for use at school, either a month at a glance, week at a glance or a spiral notebook to write in all assignments, important dates and other details. Parents need a reliable planner system too. What is your best way to keep up with papers this fall? Some ideas might be one binder with tabbed slash pockets, one folder for each subject and a homework folder, a small box file, or an accordion file with one pocket for each subject. Remember, paper management is a learned skill and very important to practice. What ways to study help you learn best? Auditory learners learn well with background music, softly playing in the background. Kinesthetic learners learn well with flashcards, re-writing and movement. Visual learners learn best with color, highlighting and underlining. Minimize distractions by keeping study time out of your child’s room. Check grades weekly online with your students asking them to assess what is working for studying. Ask all your family members to brainstorm all the stuff that must be done each week, including trash, dinner preparation, dishes, laundry, and more. Then ask each family member which task they can do best or which they prefer. When you work from your strengths and/or work on what you prefer, everyone does a better job. Ask for family members to partner in getting these jobs done too, so that no one person has to work alone. Record their responsibilities on a chart and post this again in a prominent place. Everyone has come together to work together as a team. Start this year off with a plan for everyone in your family. Keep the strategies going with encouragement and enthusiasm, hosting family meetings to continue this dialogue and communicate about other important family values. Starting new or getting back to routines makes a difference for everyone. Do you say, I would rather jump off a cliff, go to the dentist, or even run away when faced with organizing? One of the most basic emotions we have is fear when getting organized. Whether we fear being shamed, we fear loss, or we fear defeat, we must acknowledge this. In order to overcome your organizing fear, we must address where this comes from. Will stuff be gone without my permission when I am organizing? Over and over again I hear this from clients. This is the fear that a family member, friend or possibly a professional organizer will throw away their stuff. For many of clients, helpful family and friends have intervened and done a clean out. My clients know that I respect them and their belongings and we create a trust relationship in the process of decluttering. Creating a trust relationship with your organizing partner overcomes this fear. It starts with body language and reading how another judges you when coming into a cluttered space. The fear of shame is powerful. My clients evaluate my reactions, including my facial reactions, and how I touch their belongings. My clients know that our relationship will be based on success rather than consequences. Its hard to start any project when you feel defeated over and over. Overcoming the fear of defeat is build on the successes of baby steps. When organizing goes awry, our work is not to condemn, but rather to rework and “tweak” the system to work better. First, second, third and even more attempts to organize are the path to success. Focus and new perspectives overcome organizing fears. In partnering with clients, I assist them in clarifying what is next in their lives and what they want to accomplish. Opening a door for them, they can release their belongings and fears and step into a new lifestyle. In order to let go, you must know what comes next, anticipate it, and find joy in it. Letting go of fear and embracing change makes this happen. Have you overcome your organizing fear? What made a difference for you? Change is hard! We all like things, places and people to remain status quo. But there are lots of transitions that happen and in the midst of a transition, organizing begins to lag behind sometimes. It might be a move, a new job, the loss of a loved one, addition of a new family member or other change that has occurred. Here are a few tips on smoothing transitions. Keep your personal routine. Plan on getting a good night’s rest. Keep up with meals including lean protein and lots of water. The first thing we let go in times of stress is taking care of ourselves, so be sure to make this a high priority. Set priorities for your work during the time of transition. Know what is most important and must be attended to first, whether it is honoring a keepsake that is your’s after a loved one’s passing or getting your bedrooms set up asap during a move. You will feel focused and with direction, which can be very calming during this time. Create a plan so that you can work through the transition. Sometimes just having a plan makes all the difference. Make a complete list during times of transition. Just getting all your ideas and thoughts on paper makes you feel more in control. You can use your energy to get things done, instead of frantically worrying about all the items and how will it all get done. Do this every day so you can keep up to date too. Seek assistance. We all work better as a team. Find others who can help you in any way needed. It might be having help watching your kids, getting items moved, or just processing the pieces of the transition. Help is all around us, we just need to be open to asking for it. Acknowledge that “this too shall pass.” Transitions are just that – the bridge between the “now normal” and the “new normal”. We transition through different phases and stages. The “new normal” will emerge after a time too. It’s almost that time to set your college freshman off! It is a bit scary, a bit exciting and a bit overwhelming for you and for them. It takes time to get ready for freshman year, so now is the time to get started. 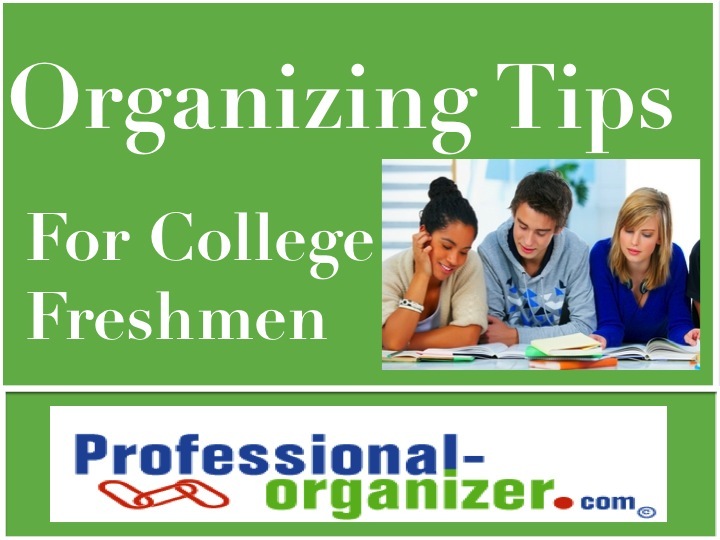 Here are a few tips for organizing your college freshman. Your time is your own in college and being productive throughout the week is important. Use a grid from a week at a glance calendar and fill in your classes, then your study time, then your other responsiblities like laundry, meals and activities. This way you can see what your week will look like and where you will have time to get everything complete. Choose a great planner to transfer this plan and to keep assignments and syllabus. For each assignment, be sure to write everything in the same calendar. You will see where assignments from different classes overlap. Being organized is more than organizing your stuff, it is also organizing your time. Need a time grid to practice on? Just email me and I will send you one! Organizing your papers in college means stepping up your filing system. Purchase a small box file to keep important documents like college forms, rental agreements, and more. For your academic papers, you can continue with a binder or switch to colored folders, one for each class. Take a few minutes each week to review what is in each folder and being sure that papers are kept in the right spot. Keep all your contacts in your phone. Contacts include email, phone numbers and even addresses. Having these all in one spot makes it each to stay connected. Add these right away when you get information so you don’t need slips of paper. Give yourself the gift of order each week. Spend a few minutes looking ahead in your calendar, getting papers back together, and planning on the next steps. You will be so glad you did! Do you have ideas to share with new college freshman? Cell Phones for Soldiers wants to turn old cell phones into more than 12 million minutes of prepaid calling cards for U.S. troops stationed overseas. To do so, Cell Phones for Soldiers wants to collect 50,000 cell phones each month through a network of more than 3,000 collection sites across the country. Since 2004, Cell Phones for Soldiers has provided over 150 million minutes of talk time to soldiers and their families. The process includes donating and refurbishing the used cell phones. The refurbished phones are sold on the secondary market. Each cell phone donated is the equivalent of a 60 minute calling card. Monetary donations can also be made on the website too. Donations should include the phone and battery, and if available chargers too. No instructions or boxes please. PostNet Kingwood and Professional-Organizer.com are partnering to host a drop off site in Kingwood from July 1 – July 31. PostNet Kingwood is located at 4321 Kingwood Drive in the HEB Shopping Center in Kingwood. Drop off your used cell phones and make a difference! Not in the Kingwood, TX area but want to donate? You can visit the Cell Phones for Soldiers site and enter your zip code. There are 8 sites to donate in Houston.